Based on comprehensive research, the artist elaborates in her video works the far-reaching territorial transformations due to the extraction and engineering of resources, drawing attention to the biological and social micro-dynamics at work in these massive physical encroachments. 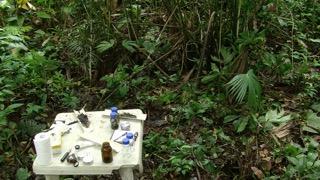 Her recent fieldwork has taken her to vital forested regions in the Americas. Engaging with the political ecology of oil and water, the artist interweaves vast cinematic landscapes with documentary footage and academic findings to narrate a changing planetary reality. Discussing her artistic practice in the projects Deep Weather and Forest Law, Biemann particularly raises questions regarding the entanglement of aesthetics, ecology and geopolitics.